There's an air of mystery around this Beautiful lady. There's no record of the Irish family being in Ohio. Also... Her name is given as Anne WALKER Weder, which would logically indicate Walker was her maiden name - not Irish. Ernest L. Pelton and Annie WALKER married Jan 1, 1884. Ernest was killed during a political argument in Minnesota. Anne later married his brother George "Ed" Pelton. Dates of Ernest death and also her marriage to Ed Pelton are unknown. Eva M. Pelton and Florance H. Pelton (1st child in each set) lived. It is assumed the 2nd child in each set died either at birth or as infants. Annie later had another daughter, Ethel, by a subsequent husband. 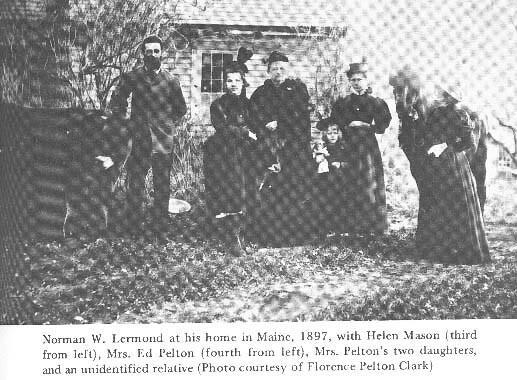 Norman W. Lermond at his home in Maine, 1897. Helen Mason (3rd from left) Mrs Ed Pelton (4th from left) Mrs. Pelton's 2 daughters and an unidentified relative. Taking things easy, Mrs. Anne Walker Weder, former Seattleite, observes her 100th birthday yesterday in a nursing home at Parkland, a Tacoma suburb. She had earned the right to relax with her birthday orchids. During her century of life, she's canned and cleaned, plowed and pitched hay, and mothered 47 decendants. She has outlived five husbands. A former Seattleite, Mrs Anne Walker Weder, will observe here 100th birthday Friday at the Kittleson Nursing Home, 321 116th St., Tacoma. Mrs. Weder was born November 8, 1863, in Marietta, Ohio. At 8 she moved to Minnesota ina covered wagon. 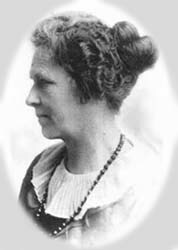 She lived in maine about 10 years before coming to the Equality Colony, a commonwealth venture near Bellingham, in 1897. Mrs. Weder has lived in the Seattle-Tacoma area since 1898. She has survived five husbands and has three daughters, 10 grandchildren, 12 greeat-grandchildren and 23 great-great-grandchildren. Her daughters are Mrs. Florence Clark and Mrs. Ethel Drake, both of Seattle, and Mrs. Eva Miller, Tacoma. Mrs. Clark, 5222 S. Mayflower St., explained her mother attributes her longevity to the hard work she has done most of her life. "She lived on farms for many years and helped with the plowing and pitched hay like a man," Mrs. Clark said. Mrs. Anne Walker Weder, who has lived in the Seattle-Tacoma area since 1898, will observe her 100th birthday anniversary Friday at a Tacoma nursing home. Mrs. Weder hs made her home in Tacoma since 1931. She was born November 8, 1863, in Marietta, Ohio. She was a Maine resident before moving to Equality Colony, a commonwealth settlement near Bellingham, in 1897. 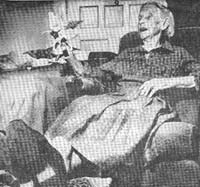 Mrs. Weder spent a anumber of years on a small farm on Vashon Island. She is the widow of Paul Weder. The three children of Mrs. Weder are Mrs. Florence Clark and Mrs. Ethel Drake, both of Seattle, and Mrs. Eva Miller, Tacoma. Mrs Weder also has ten grandchildren, 12 great-grandchildren and 23 great-great-grandchildren.